"'Ain't it wonderful, Jim, how much people can mean to each other?'" Published by Houghton Mifflin Co. on September 21, 1918. 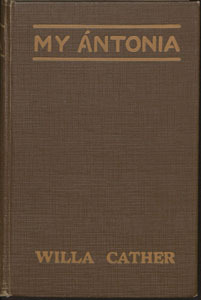 Published by William Heinemann in October 1919. Published by Houghton Mifflin Co. in 1926. Published by Heinemann in 1927. Published for the Readers Union by William Heinemann Ltd. in 1943. Published by University of Nebraska Press in 1994. Edited by Charles Mignon, assisted by Kari Ronning. Historical Essay and Explanatory Notes by James Woodress. Assistance with Explanatory Notes by Kari Ronning, Kathleen Danker, and Emily Levine.